Cheap labor is one of the strongest factors behind Bangladesh's remarkable success in the global market for Ready Made Garments (RMG). According to Tariq Adnan (see: www.omicsonline.org ) a Bangladeshi has to earn at least US$ 314 per month to house, clothe and feed a family of five. But even the top most Bangladeshi garment factory worker earns only US$ 218 per month, he points out. And if a five-member family is to get the right amount of nutrition and calories, it has to spend US$ 435 on food alone. But as of now, an average worker's family spends only US$ 168 on food. Adnan's survey found that 70% of the garment workers complained that they had no savings. 'According to Bangladeshi law, workers are supposed to work an eight-hour shift. However, garment workers are forced to work extra hours on a daily basis in order to meet production targets set by factory owners. Research shows that around 80% of women workers leave the factory between 8 pm and 10pm after starting work at 8 am, violating Bangladeshi labor laws which state that under no circumstances should daily working hours exceed 10 hours,' Shahab Uddin says. 'The worst part is that, after doing overtime, women workers often remain unpaid. Factory owners cut their overtime payment whenever they want. Female workers are cheated more often than men, as they are seen as quieter and less likely to complain. It is also noticed that only a small number of the workers receive letters of appointment, while most of them carry only a factory identity card,' she adds. 'In 2011, the Prime Minister of Bangladesh announced that maternity leave would be extended to six months, but it remains unclear whether this will be implemented outside the civil service. Factory owners set various types of maternity leave provisions but these were not favorable to women workers,' Shahab Uddin pointed out. 'Another inhuman practice which impacts most of the women workers is that many of them are forced to work during the final stages of pregnancy to meet the production targets which seriously hampers the health of both mother and child,' Shahab Uddin notes. 'Naturally, these excessive pressures have had an adverse impact on women workers' health and mental stability. Women workers reported concerns over long periods of separation from their children, particularly women with young children who are being breastfed,' Shahab Uddin says. One of the reasons for the garment workers' pitiable plight is the fact that the trade unions in the garment sector are weak and too few in number. 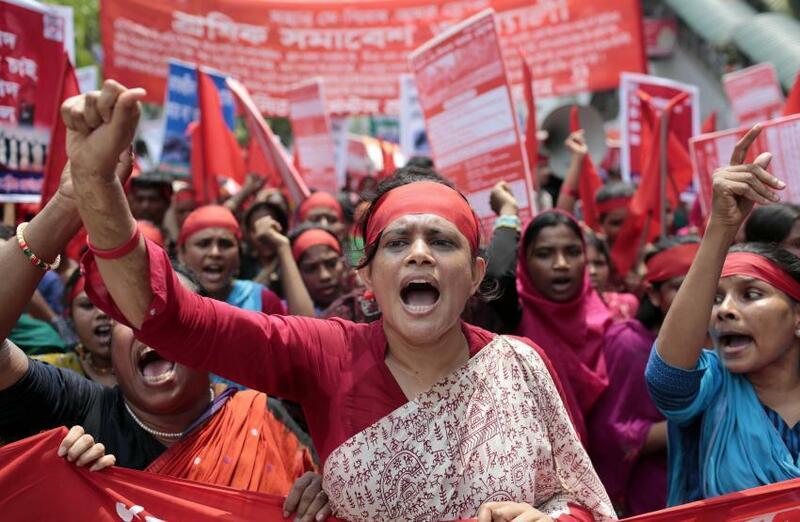 According to www.lawatthemargins.com , unionizing workers in Bangladesh is not an easy task. Trade union organizers say that they get beaten up by the police or the factory hooligans.